This bowl was made by a wonderful lady in the Italian speaking part of Switzerland and is one of the most beautiful items I’ve ever purchased. It was an engagement gift for a very dear friend. 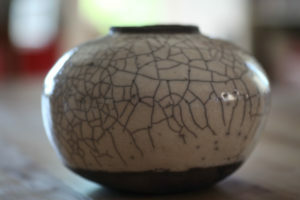 The pot is made of clay, fired in the ancient Raku technique. I love the way it is not completely symmetrical and it reminded me immediately of the Japanese philosophy of Wabi-Sabi. When I saw the works of this great artist they were artfully draped with jewellery by a Russian designer – However beautiful the jewellery, I saw only the pots… and still do! Wabi-Sabi is extremely difficult to explain, involving aspects such as simplicity, beauty in imperfection, truth, the idea of impermanence. Yes, it’s quite hard to define. 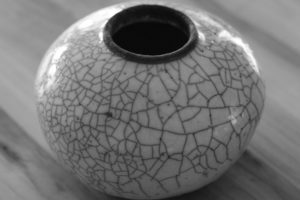 The aesthetic of Wabi-Sabi has long been associated with elements of the Japanese Tea Ceremony and the bowls used there often have a deliberate natural and imperfect touch.